Iona's A.J. English begins his season on the road against Valparaiso. Will he be able to lead the Gaels to a season opening victory in our "spotlight game?" Photo courtesy of ICGaels.com. Iona at Valparaiso! New Mexico State hosting Cullen Neal and New Mexico! Could the first Sunday slate of college basketball be better? NFL Football? No thanks! How about college basketball? Today, VAVEL's Tyler Bennett and Peyton Wesner will attempt to break their tie atop of the standings with a plethora of mid-major battles in addition to power conference teams hosting squads with quite the reputation for upsets. ---14.0 PPG, 6.0 RPG, & 1.0 SPG. ---11.0 PPG, 11.0 PPG, 2.0 APG, & 1.0 SPG. The Boilermakers are coming off a big win over North Carolina A&T, while Vermont is coming off a big loss over Eastern Michigan in their opener. Unfortunately for the Catamounts, the road doesn’t get any easier. Purdue’s forward trio of Isaac Haas, Vince Edwards, and Caleb Swanigan combined for 34 points and 26 rebounds on opening night. Vermont’s guards can keep the game respectable, but Purdue wins in a rout. On Friday, the spotlight was on Vermont and they faltered. It was as simple as that. After taking a 30-27 lead into the locker room, the Catamounts laid a metaphorically goose egg by being outscored 43-20 in the second twenty minutes. Even more surprising, they allowed that to happen with Eastern Michigan's leading scorer Raven Lee not dressed due to a violation of team rules! With the following in consideration, Purdue should have no trouble this afternoon. Look for Freshman Caleb Swanigan, who posted a double-double in his first collegiate game, to dominate a rather small Vermont team. ---28.0 PPG, 8.0 RPG, 2.0 APG, & 2.0 BPG. ---21.0 PPG, 8.0 PPG, 2.0 APG, & 3.0 BPG. In the Bearcats’ opener, the forward duo of Gary Clark and Octavius Ellis made their presence felt by going 17-of-21 combined from the floor for 38 points. For the Colonials, they used a big comeback in the second to contend with Penn, but lost by 1. The hole they dug for themselves in the first half was too big to overcome. Facing a tougher Cincinnati team, the Colonials can’t afford another rocky first half. The Bearcats are too balanced for the Colonials, and come out on top. If you don't know who Rodney Pryor is, the time has come to learn his name. Why? He will be the reason Robert Morris has any chance to make the NCAA Tournament. The "jazzy junior" had a phenomenal game in a losing effort Friday night as he dropped 28 points and grabbed 8 rebounds against Penn. He may do so again today at Cincinnati. Although the sample size is small (1 game), it seems the Bearcats do not have the same defense they predicated their success on in the past. Despite that case though, the fact "star senior" Octavius Ellis has other weapons around him such as Gary Clark and Coreontae DeBerry will be too much for the Colonials. ---24.0 PPG, 7.0 RPG, & 1.0 SPG. Valparaiso is coming off a hard-fought win over IPFW, while this is Iona’s first game of the season. 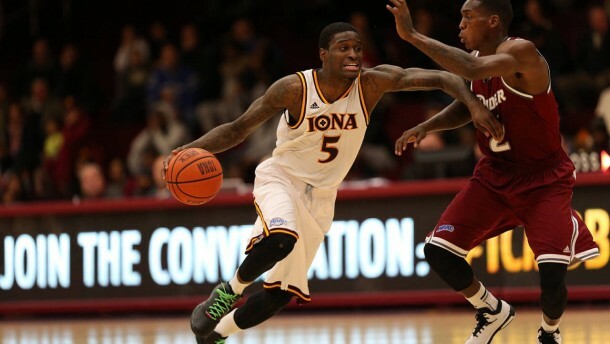 Iona will be led by star guards A.J. English and Schadrac Casimir, but will need Wake Forest transfer Aaron Rountree to step in and replace David Laury. For Valparaiso, they’ve got a game under their belts, and have had time to iron out the kinks. Their guards can compete with those of Iona, and the Crusaders’ forwards (Alec Peters, Vashil Fernandez, and David Skara) are superior to the forwards of the Gaels, which will be the difference in this high-scoring affair. In a matchup that causes college basketball fans to reminisce about the old days and ESPN Bracketbusters, Iona travels to Indiana for a great matchup against Valparaiso. The Gaels, who are without David Laury this season due to graduation, have more than enough offense to compete with any team in college basketball. Unfortunately, their defense can be classified as average at best. While it is very unlikely that A.J. English, Schadrac Casimir, and Isaiah Williams' Gaels will be able to contain and keep Alec Peters from dominating the paint, this journalist's love for high scoring teams will cause him to ride with the Gaels. Look for aforementioned English and Casimir to combine for 40+ against the Crusaders' inferior in comparison guards. ---20.0 PPG & 3.0 RPG. ---25.0 PPG & 14.0 RPG. The Illini were dealing with their fair share of injuries, and Jaylon Tate is the latest to go down. Tate was injured in the Illini’s opening night loss to North Florida, and will miss an undisclosed amount of time. That’s bad news for Malcolm Hill and the Illini, as they take on another tough foe in North Dakota State. The Bison fought back in their opener against UC Davis, and took out the Aggies in overtime behind a double-double from Dexter Werner. The situation isn’t good in Illinois, and they will get upset for the second-straight game. The Illinois Fighting Illini are going to have the tough out the next few weeks without Kendrick Nunn AND Jaylon Tate. Illinois was defeated, not upset, by 2015 NCAA Tournament team North Florida on Friday night in a very high scoring contest. Today's matchup will not be any easier as they take on another tournament team in A.J. Jacobson's North Dakota State squad. Fortunately for the Fighting Illini, the Bison are not as strong as they once were, for the Summit League's leading scorer Lawrence Alexander has graduated. If Mike Thorne Jr. and Malcolm Hill can replicate the way they played in the opener today, Illinois will come out on top. ---12.0 PPG, 7.0 RPG, 2.0 APG, & 1.0 SPG. The Redhawks got blown out in their season opener at Dayton, and their schedule gets tougher with a road date at Evansville. The reigning CIT champions return virtually everyone on offense, led by stellar scorer D.J. Balentine and big man Egidijus Mockevicius. This is the first game for the Purple Aces, but there is no cause for concern as they will roll to a big victory to open their season. The Evansville Purple Aces, who won the 2015 CollegeInsider.com Tournament last March, bring back all five starters from last season, including MVC first teamers D.J. Balentine and Egidijus Mockevicius. Honestly, considering the talent back, this is the best opportunity for any Marty Simmons club to make the NCAA Tournament. Though, since this is Evansville's first game, look for Southeast Missouri State to hang around in the first half, mainly because of Antonius Cleveland, before pulling away to a double-digit victory. ---14.0 PPG, 6.0 RPG, 4.0 APG, & 4.0 BPG. ---22.0 PPG, 4.0 RPG, & 1.0 SPG. Minnesota looked like they were in danger on opening night against UMKC until Joey King went on a roll and took the game over for the Gophers. Minnesota cannot afford another slow start against the Warhawks, who will also administer a stern test. The Golden Gophers used their defense to shut down the Kangaroos’ stars on opening night, and will need to shut down Majok Deng and Justin Roberson on Sunday to come away victorious. Although Louisiana-Monroe's roster is missing Tylor Ongwae from the graduation, the 2015 College Basketball Invitational Finalist is still a very dangerous team. Led by Majok Deng and DeMondre Harvey, the Warhawks have a great opportunity to upset Minnesota on the road. Though, if Joey King plays as he did on Friday, ULM will not be able to defeat the Golden Gophers in their gym. ---17.0 PPG, 8.0 RPG, 7.0 APG, 3.0 SPG, & 1.0 BPG. ---13.0 PPG, 4.0 RPG, & 1.0 SPG. At least for one night, the Rattlers didn’t look like they missed Jermaine Ruttley on offense, having four players score in double-figures. Unfortunately, they were taking on Johnson University. On Sunday, they take on their first Division I opponent, and they struggled against top-level opponents last year. Southern Illinois is coming off a comeback win over Air Force, and Anthony Beane's Dawgs will cruise over Florida A&M in this one. Okay, so star senior Anthony Beane didn't have a great game against Air Force on Friday. But, today he will versus Florida A&M. The Rattlers entered began their 2015-2016 season with a win against a non-Division I school. Through this journalist's eyes, the victory means very little. Yet, the fact that leading scorer from last year Jermaine Ruttley is with Arkansas-Little Rock via transfer will loom greatly for the course of the year. Keep an eye on the aforementioned Beane, in addition to Tyler Smithpeters, as both have the potential to have very good games. Also, do not expect A&M's Malcolm Bernard to come anywhere close to triple-double. ---22.0 PPG, 10.0 RPG, 1.0 SPG, & 1.0 BPG. ---16.0 PPG, 6.0 RPG, & 6.0 BPG. On opening night, the starting guards for UC Irvine didn’t have their best stuff, but big man Mamadou Ndiaye did his part to lead the Anteaters over UC San Diego. The team will need their guards to be at their best on Sunday, since they are taking on their first Division I team of the season in Loyola Marymount. Tonight expect the Lions, who held on down the stretch to top Cal State Fullerton to begin the weekend, to be tested on defense while the Anteaters squeak out a victory to move to 2-0. Mamadouuuuuuu! Mamadou Nidaye, a seven foot, six inch ruler of the paint for UC Irvine, will dominate the Loyola Marymount Lions Sunday. Why so sure? Loyola Marymount's best two rebounders are six foot, eight inches, and six foot, nine inches; meaning Nidaye will have a nine inch height advantage! Granted Mike Dunlap's squad will play help defense on the monstrosity, but that will just lead to open three pointers on kick-outs. While Nidaye will make a difference for the Anteaters, Adom Jacko looks to produce another double-double for the Lions. But it won't be enough this evening. ---22.0 PPG, 2.0 RPG, 4.0 APG, & 2.0 SPG. ---26.0 PPG, 10.0 RPG, & 2.0 BPG. The rivalry between the Lobos and the Aggies is one of the best in the country as they face off twice in non-conference action. In their season opener, the Lobos had a healthy Cullen Neal back in the lineup, and rolled over Texas Southern thanks to 22 points from the sophomore. The Aggies rolled over Houston Baptist behind 26 points from Pascal Siakam. Both teams used big first half performances in their openers, so expect a high-scoring affair here. In the end, the Lobos pull out the victory over their instate rivals. Last season, not once but twice New Mexico came out victorious in the Rio Grande Rivalry. Interestingly enough, the aforementioned victories occurred without "sophomore stud" Cullen Neal (suffered season ending injury in third game of season). Nevertheless, the following does not mean New Mexico will automatically come away with a win versus New Mexico State as Pascal Siakam will have something to say about it. Siakam, who will be a candidate for WAC Player of the Year when awarded this March, had a very strong showing Friday, for he posted a double-double against Houston Baptist. Do not expect the very talented sophomore to have as great of performance with seven footer Obji Aget guarding the paint. In a game that contains two of the best youngsters in the nation, the Lobos shall walk away with no wounds and a win. ---15.0 PPG, 7.0 RPG, 1.0 BPG. ---18.0 PPG, 9.0 RPG, 2.0 APG, 3.0 SPG, & 1.0 BPG. The Chanticleers showed that they are a different team without Josh Cameron and Warren Gillis in the lineup on opening night by running out of gas down the stretch in a big loss to Nevada. They have the talent to contend, but need to make shots. Elijah Wilson was just 2-of-13 from the field, but that will change on Sunday. Hawaii held on against Montana State, and received a big game from Roderick Bobbitt (10 pts, 14 ast). Coastal Carolina will find their offensive groove and knock off Hawaii on their home floor. On Friday, the Coastal Carolina Chanticleers business trip to Hawaii didn't start well, for they were defeated by Nevada. Tonight their time in Honolulu will not end pleasantly. Coastal Carolina's guard duo of Elijah Wilson and Shivaughn Wiggins were absolutely awful in the season opener and only produced a combined eight points and two assists on 2 for 19 shooting. Is that bad? It's not good! Obviously one should not assume the talented guards will have as poor of outing versus Hawaii, but as a team the result will be the same since the Rainbow Warriors possess a very experience bunch. Starting with "jazzy juniors" Aaron Valdes and Stefan Jankovic, yet not forgetting seniors Sai Tummala or Roderick Bobbitt's influence, Hawaii has one of their most well-rounded teams of the decade.